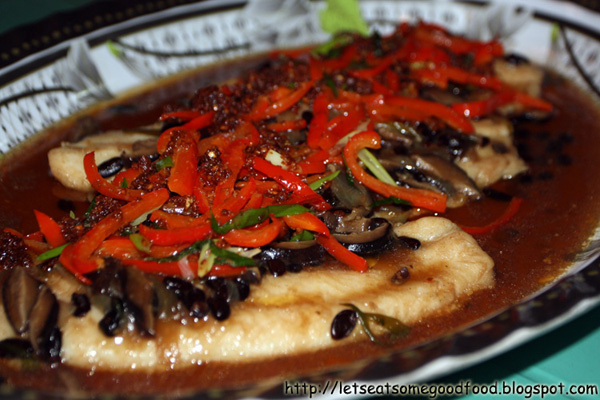 Fish Fillet In Tausi Sauce Recipe – Eats Yummy! Ana cooked Fish Fillet In Tausi Sauce couple of days ago when we celebrated her Ate Rovi’s birthday. This is one healthy, good food and easy recipe dish that you would love to try cooking at home. In this filipino recipe for Fish Fillet In Tausi Sauce, she uses cream dory, but you may use any fish of your choice. Although it was really Ana’s first time to cook this food recipe, it still turned out to be so tasty making it the newest entry in good food section. Here’s one recipe for everyone who wants to try something for their talent. Combine the ginger juice and sesame oil in a bowl then put the fish fillet. Mix to blend. Saute some garlic and ginger in oil. Add the black beans and mushroom and season season with sugar, soy sauce, and pepper. Simmer for 5 minutes. Place the sauce on top of the fish and steam for 10 to 15 minutes or until cooked. Discard the ginger and leek topping, then transfer the cooked fish into a serving platter. Heat oil in a pan and saute garlic until golden brown. Add the leeks and bell pepper and stir-fry for few minutes. Top this over the fish.